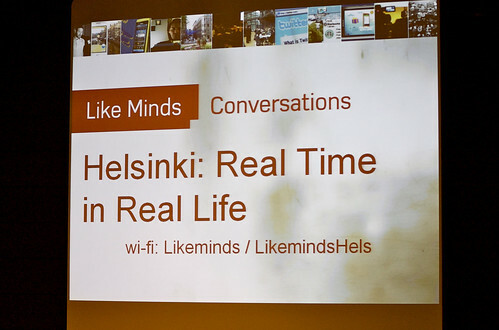 Two weeks ago I found myself in Helsinki for the Like Minds conference, a day of presentations and panels about social media, mobile and augmented reality. I was one of 3 bloggers that was invited along and flown over by Nokia and WOMworld, and it was a pretty cool experience. I woke up that day at 3am to make my way to Schiphol airport, catching a flight from Amsterdam to Copenhagen and then another to Helisnki. Around 12, I arrived at the awesome 5 star hotel and made my way to the conference venue. There were 4 keynotes and 3 panels all with the theme “Real Time in Real Life”. Besides that, attendees were encouraged to discuss the talks with one another during “Crowd Discussion” breaks. This was a presentation from Oisin Lunny, the UK Managing Director for Sulake, the company behind Habbo Hotel. He talked about the history behind Habbo Hotel (how it started as a hobby project as a virtual chat room for a Finnish band, but grew into something more) and what made it so successful. Habbo Hotel allows teens to create their own virtual rooms, which are customizable in all sorts of ways. It’s all about facilitating creativity, providing the tools so that teens can build their own worlds (“create the theatre, not the play”). Lunny explained how Habbo Hotel was monetized, from sponsored rooms to creating luxury virtual items. Andy Gstoll from Mobilizy held a talk about Wikitude, an augmented reality app for your mobile. They currently have 2 products; the first being Wikitude World Browser. This uses your mobile’s camera to show you the world around you, but with additional information. You can load different “content worlds”, each showing specific info, like what tourist attractions are located near you (and in which direction) or where the closest Starbucks is. The second application is WikiTude Drive, a navigation system, that shows you the real world with directions overlayed in real-time camera view; instead of a 2D map you actually see where you’re driving and where you have to go. I love the idea behind both applications, but how practical is it? The most useful time for me to use something like this is when I’m on holiday in a new and unknown location to check out tourist stuff, but most of those times that’s another country… where I don’t have a proper data connection (or risk paying tons for roaming charges). Using it in my own town could be cool, but most cases can just as well require simple 2D maps instead of augmented reality. What are those special cases where I’d NEED augmented reality? Myles Peyton from Total Immersion demonstrated the augmented reality technology his company was working on. This was kind of the opposite of Wikitude, here you had something tangible (like a magazine or a card) that you held up in front of a camera and extra ‘things’ would appear in screen on whatever you held. 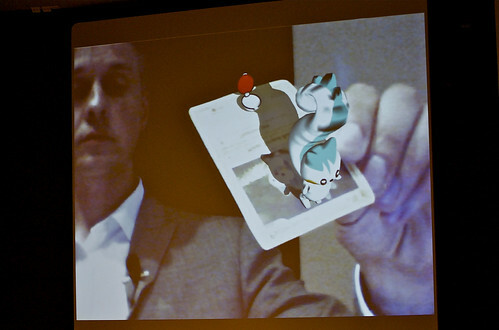 The coolest example (for me that is) was with Pokemon cards: Myles held up a Pokemon trading card in front of the camera and on screen you saw that Pokemon come out of the card. Holding a second card near it caused the two Pokemons to battle each other with flashy animations and everything. Another example was an ad in a magazine that showed videos of the product when held up in front of a camera. It all looked awesome, but again I wonder how practical it actually is. Would kids really go and sit behind the computer/camera to see Pokemon battle this way? Would somebody with a magazine sit behind his laptop to check out the ads? Cool technology, but somebody needs to come up with a killer idea and situation where people would use this. This was an awesome talk by Joanne Jacobs. Again I was way too busy listening instead of taking notes, but the gist of it was that a lot of “reality” has downsides (it’s bureaucratic, isolating, etc) and these are solved by the virtual world. I’m hoping a video of this will appear online soon cause I can’t do justice to it by trying to explain it here. I really enjoyed the Like Minds conference, kudos to Drew Ellis and Scott Gould for creating such a great event. Some of the talks were a little bit too marketing pitchy for my taste, but seeing as most people attending were marketers, I guess that was the whole point (in other words, I wasn’t exactly the target audience, but still enjoyed it). After the conference, there were drinks with all the attendees and speakers and I got to meet some interesting people (*me waves at those of you who might be reading my belated blog post*).